First of all I must say both of them have really good innovations. Android for benefiting millions of people by giving at least a phone that could run a smart stopwatch app and call that device a smartphone and Windows Phone for providing something people can use easily and get to know quickly. What makes me surprise most is Windows Phone being able to facilitate a better user experience with a dual core processor which Android does with a quad core processor. 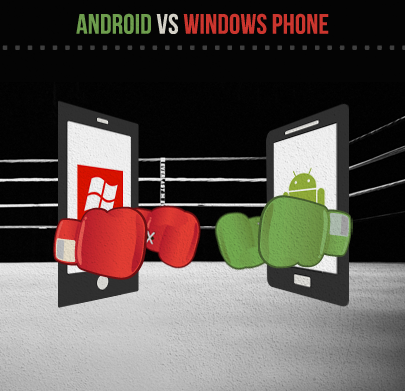 The time I am writing this post, Windows Phone is no where with the number of devices when compare with Android and my ex-favorite iOS. Start making notes about the developer perspective, Windows Phone is way far better than Android and you will realize why eventually. You need to have 25 USD to create a Google Play account and 49 USD for a Windows Phone developer account. The cost is much in Windows Phone but the store team make sure your app is safe for the end user to be used where as Google Play is filled with apps that have malware due to lack of proper certification process. For Google Play it takes only 4-5 hours but Windows Phone take more than double time at the best case and can be gone up to 5 days even. This is because they test the app on minimum of 5 devices under different themes and conditions to ensure the user is served with a better user experience. There are many IDEs could be used for Android development as Eclipse being the most used. But the developer experience is horrible compared to the Visual Studio. of course Android has many plugins to install and make things easier but with Visual Studio all can be done without external plugins. Even if you need, they are just a couple of clicks away. Visual studio has in built debugging facilities as well as watch windows where you can test the app by even going through the variable levels. You can cook your dinner while keep loading the Android emulator as it is very slower where as Windows Phone emulator is much smoother since it runs on Hyper-V. Yes there are some certain requirements you need to run a Windows Phone emulator but a person who can spend 49$ to buy a developer account will definitely have a better laptop or a PC. Another good experience with the Windows Phone emulator is the availability to check on location based apps and smooth experience on the testings for accelerations. A smiling face for an Android UI designer is very rare sight in the early days of his/ her carrier as even drag and drop options are not much supported well. Eventually with the experience they will be able to start designing well when they get to know that xml syntax well. Another painful thing is the need to design in to many screen resolutions in some situations. Right now Windows Phone supports only 3 resolutions and the difference is marginal. Therefore one resolution could be used to benefit others as well. Also Microsoft has a really cool tool which makes even animations a matter of 3-4 clicks work. It is expression Blend. Not only the drag and drops, making gradients, testing in different color themes as well as testing with custom themes is also simplified with this supper awesome tool. Here the win definitely goes for Android since the number of devices that runs Android is very much. But your app need to be smarter to beat all other apps and make your one the choice. If you are a .NET developer, learning Windows Phone development is just a couple of days work where as for Android you need to spend more time. So I think I have made the right choice by being a Windows Phone developer. What do you say? I have zero knowledge in Android (java) or WPos (.net) but I'm a PHP guy, working with both Win and Unix. Developer access charges and the IDE does not really matter IMO. If the language is well written and the APIs are clear, I think the developers are more than happy. I have used all iPhone models (except the iPhone 3gs, now an iPhone 5) and as far as I can see, iOS has much better environment and a welcome for developers. It's hard to get the app approved, and a developer account costs you a freaking $100, but back in turn, you have lots of developer resources, well-written API docs and everything else. ane saho mage laga apple i phone 4 ekak thiyenava. meka icloud lock ekak ellanava nitharama.. mata me lock eka kadala hari jail break karala hari hadaganna vidiya tikak kiyla dennako..ubata loku pinak macho.